I have been writing these last few months about things we can do to improve our experience of the ‘every day’, even if we do not perhaps feel like doing those things in the first place. I mean: cold showers!?? In February!? YES! (these are my daily practice even now – yes, they are a wee bit more challenging in winter, but they still make me smile when I get out of the stream of icy water, the whole being buzzing with energy, all sleepiness and brain fog a distant memory – find the blog post HERE. Anyway…. This time I am here with an altogether different, and a lot more inviting, ritual! I am here to give you an idea of a special treat that it is actually rather good for you. I’m not suggesting you eat it for breakfast (though maybe on your birthday you could! ), but as you will see below, there are quite a few benefits of indulging in this fun, and very shareable, desert. I am talking about a chocolate fondue. Personally, I have been eyeing the delicate mini-fondue sets in which you heat a yummy chocolate sauce over a tea light for years! I am not sure what stopped me from getting one until now, as they are not even that expensive. However, now that I have one, it comes out to play at every opportunity I have, and not only my family and friends, but also my retreat students have been invited to indulge and dip the long thin forks bearing various types of dippers into the pool of chocolatiness. I have found a simple enough recipe online, but then, for my retreat, I needed to recreate it in a vegan form. I have later served the vegan version to my omnivorous friends, who commented on the delicate taste of the mix, dark cacao layered with coconut, and so now this is the recipe I make every time. I use dark, 70 to 75% cacao chocolate, though of course you could go darker if your taste buds enjoy the deep bitterness. You may even choose to go all raw, but then be careful eating this later in the evening as some people can be sensitive to raw cacao products, and may want to stay chatting till 4 am as they are unable to sleep while they ride the raw cacao wave (I know – I am that person!). When cacao has not been spoiled with white sugar, soy and other non-desirables it can have many health benefits. 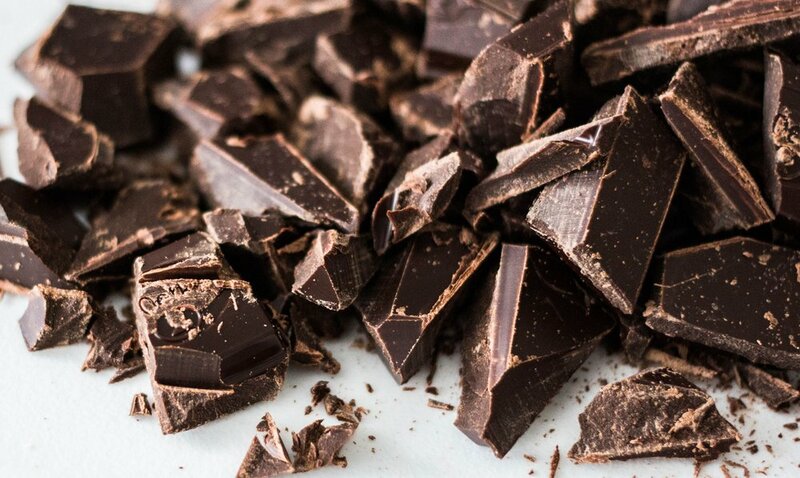 Dark chocolate is often celebrated as a source of Magnesium, a super important mineral, which many of us these days can be depleted in. Magnesium is vital for the absorption of Calcium, it supports healthy nervous system and it is also a muscle relaxant – perhaps that is why us women are often drawn to chocolate during our periods. Cacao beans are also full of antioxidants, helping to keep us feeling and looking younger. And it contains Theobromine, a substance quite rare in nature, and one that gently stimulates the nervous system, giving us a happy buzz, when consumed in the form of dark chocolate. Selection of fruits, raspberries, sliced bananas, tangerine segments and pear slices are a great match, but let your imagination run wild. I have used pretzels, crunchy biscotti, soft sponge like mini cakes – you can make this as varied you like! Break the chocolate into pieces and add the coconut cream, and into a bain marie, or simply a glass or stainless steel bowl suspended over a saucepan of gently simmering water (no plastic please!). Then watch the two melt together beautifully together. Then use a balloon whisk (or a fork) to thin out the mix with the milk. You may choose not to use all the milk if you like your fondue thicker. Personally, I enjoy add one little splash of sweet dark rum added to the basic recipe at the end, as it lifts the flavours and makes them sing on your palate and in your nose as the aromas mingle. You could also add a drop of food grade Orange or Lemon essential oil, maybe even Ginger or Cardamom, some Raspberry liquor or non alcoholic plant extract. So many wonderful flavours go with and enhance the magic that is chocolate! So do not let my recipe limit you; use it instead as a starting point on your own chocolate journey at your own dinner parties or cosy romantic suppers for two. As we also enter the party season, we tax our bodies a little bit more at night, and so if we can upgrade what we do in the morning, it will help our body to regain its balance more easily. That way we will have more energy to enjoy all the fun that this season brings with it. Are you a creature of habit? Do you wake dreading the day ahead? Grab your phone before you even opened your eyes or your feet touched the floor? Does this leave you feeling exhausted, grumpy and stressed? Read on for some morning musings peppered with small ideas that may bring big changes to how you start the day. A lot has been written on the virtues of a cold press vegetable juice, but did you know that it can also be a very good temperature regulator? Blanka, who has to spend some time in Summer working from her boss’s home office space ‘under a hot tin roof’, shares her strategies for cooling it down when you have no access to air conditioning. Use the ancient Ayurvedic technique of oil swishing to take gentle but powerful care of your oral cavity, clear toxins out of the body and freshen your breath. Using cold pressed oils with some healing botanicals might be just the upgrade that will make your gums sing with radiant vitality and your teeth shine with health. Turn the dial in your shower the ‘other’ way to start your day feeling empowered, full of energy, and with vibrant healthy skin to boot. Emerging after the long dark weeks of central heating, our skin may not feel as wonderful as we wish it was, and needs to be teased from its winter-induced sleep to show itself in all its vibrant glory.